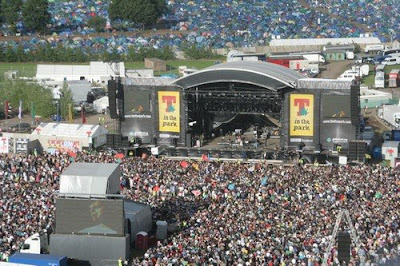 Over the past week, a clear winner has emerged from T in the Park. Snow Patrol? Nah. Kings of Leon? Noooooo. Blur? Schmur. It's Pet Shop Boys who have triumphed, garnering praise from all corners for an immense performance at what is predominantly, a rock festival. Just look at the glowing comments here. And if you're in the UK you can watch THE WHOLE amazing hit-filled performance at the same link. It's essentially the Pandemonium tour show, ever so slightly condensed. For some great images of the merchandise and the tour programme being created, go here to Mark Farrow's site. Scroll down though! More PSB news... the Boys are Number 1 in the Billboard Dance Charts with Love Etc. Or at least they will be on Monday when the new chart is released. Quite a feat considering the first of the NINE number ones was West End Girls in 1986. The rest are: What Have I Done to Deserve This? (1988); Can You Forgive Her? (1993); Go West (1993); Before (1996); To Step Aside (1997); New York City Boy (1999); Break 4 Love (2002); Love etc. (2009). MPHO, with her new single Box 'n' Locks and upcoming album, Pop Art, is causing everyone to fizz at the gash. Something her peeps have picked up on. The lovely XO gets and honourable mention on the Brixton singer's own website here. She has a vare entertaining blog detailing her exploits including a phone call from Martha (as in 'and the Muffins') wishing her luck with the single sampling the Echo Beach riff. XO's Middle Eight also previews the Pop Art album with a special YouTube sample mix. It sounds bloody marvelous! Here's the video for London synthpop singer James Leon's first single, Purple Heart out soon on Swedish label Electric Fantastic. Watch this space for more details. Also, this is where I declare more than a vested interest. Go here to listen to a remix, included in the single package, done by liddle ole me! Bona! Chicane's video for Poppipolla is an entertaining update of the Guardian newspaper TV ad from the 90s. But the song is even better. Sampling (heavily) Sigur Ros' Hoppipolla this is a PERFECT summer driving track. Picture it: bright sun; hot breeze through the open window; blue skies, beach to the left. Oh. I've just looked out of my window at grey clouds over London. I think I'm going to cry. I had no idea about MPHO until I saw it here. "Bona!" And your Leon remix is so very Duran! I'm so shocked that "Break 4 Love" made it to number one. How did I not know that?